After scoring the deal of the century on flights and the Formula1 dates being announced I’ve been waiting for Sepang Circuit to put them on-sale. So how are those Formula1 plans? When Sepang Circuit slipped the tickets on-sale last Monday I quickly secured some Topaz (Upper level, back straight) Grandstand tickets at an exceptionally good value 50% discount. For me this was an essential part of the trip plan as my travel insurance includes event cancellation and changes in its cover. Now if the Formula1 race is cancelled, postponed or moved I have some insurance to deal with it. This has also meant that I’ve started feeling more comfortable about locking in the side-trips to LegoLand (yes I know I’ve been before) and for something different a couple of nights in Penang. 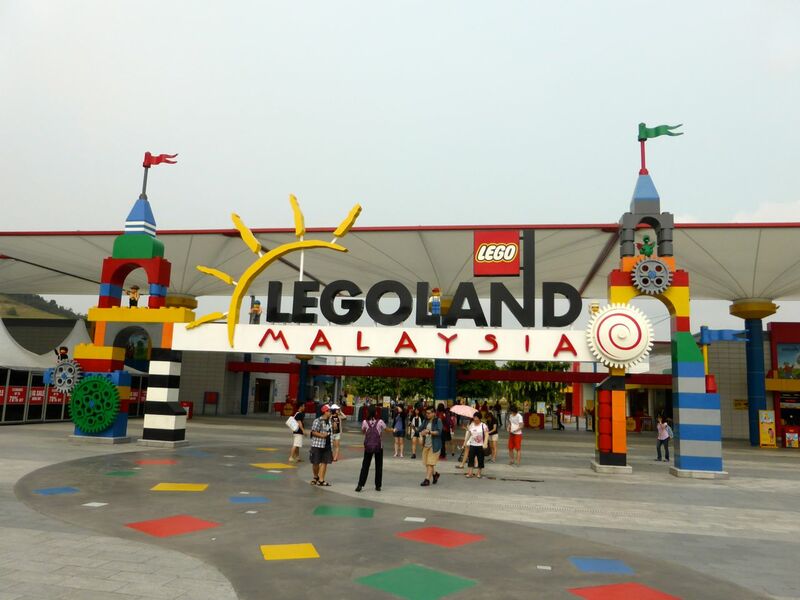 LegoLand is located down in Southern Peninsular Malaysia and a short distance from Singapore. So after a few days in Kuala Lumpur I’ll board my flight to Johor Bahru and spend 4-nights checking things out in a bit more detail. Flights were cheap, I initially tried searching using a few different engines like Zuji, Bravofly, Expedia and the trusty Skyscanner only to realise that sometimes making an effort to check directly with airlines pays off. Onto the Malaysia Airlines website I went! So for 120RM I had return flights from KUL to JHB, including checked and carry on luggage. Even the normally competitive AirAsia couldn’t match that! I’ve yet to book the accommodation for this side-trip. Naturally I’ll be resorting to my favoured standby of Hotels.com but this time will also add LastMinute, Expedia and a few others into the mix. Heck it may be time to forget my aversion to bad spelling at check out Otel.com! The planning for my trip to Penang was a little different. With only a couple of nights “spare” in the itinerary and a desire to go somewhere different I hit up the usual suspects (Zuji, Bravofly, Expedia, Skyscanner) and once again settled on going direct with a twist. Yes readers, I booked a flight on a smart phone via an airlines app! 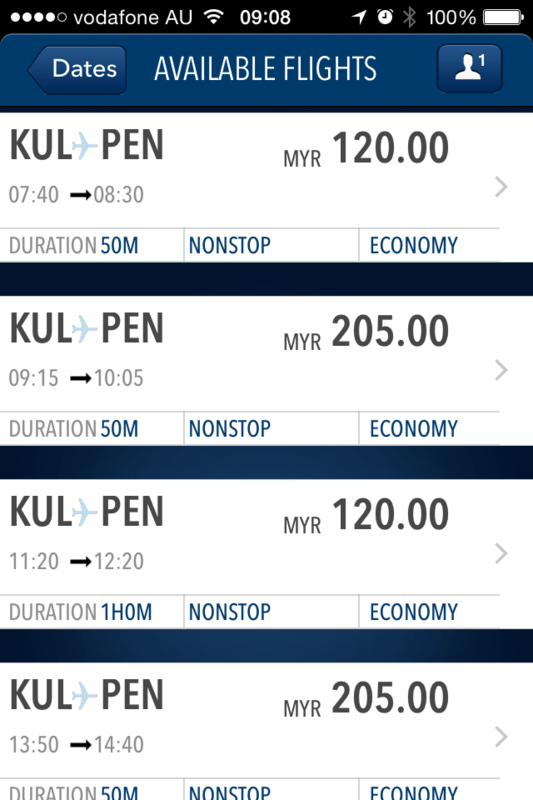 It was with Malaysia Airline again, and amazingly for the same 120RM Return that I was already paying to fly KUL to JHB. The MHMobile App worked very well right down to scanning my Credit Card! A small “glitch” was having to populate all of my details into the App, I would have thought these would be imported from the profile I have with Malaysia Airlines Enrich Frequent Flyer Program. Still it’s not too hard to set put details in and make bookings. To push the boat out in experience even further I used the Hotels.com App to book corresponding accommodation in Penang! All done while enjoying a coffee with a work colleague! Where or rather what next? The world of travel has come a long way in just a few short years and as I’ve now locked in some 6 nights outside of Kuala Lumpur it’s time to hit TripAdvisor and start to get some more ideas on what to do with the remaining 4 nights in KL.